Time: 7:30 a.m. to 2:00 p.m.
We have reserved the 3rd floor of the Rotunda and will have table spaces available for up to 25 affiliate organizations. The event is both educational and informative. We hope citizens and legislators alike will tour the affiliate booths to learn about the diverse outdoor passions of Missourians. 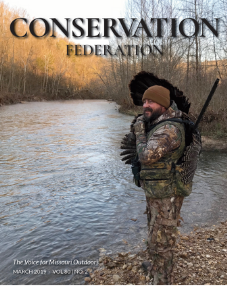 Citizens will have a chance to meet with their legislators and thank them for protecting conservation in Missouri. The Morning Shag with Shags and Trevor of KCMQ 96.7 will be broadcasting their popular morning show live from 6:00 to 10:00 a.m.
To reserve a booth for your affiliate organization, contact Michelle Gabelsberger at 573-634-2322 ext. 104 or mgabelsberger@confedmo.org.